A federal judge in North Carolina has denied a motion to set aside the 2011 jury conviction of a Bernard von NotHaus, an antigovernment activist who minted and sold his own silver coins in competition with U.S. government. The protracted and complex legal case attracted widespread interest from gold and coin enthusiasts, as well as antigovernment activists and antigovernment “sovereign citizens” who say the government cannot control them. The 47-page ruling, filed Nov. 10 by U.S. District Judge Richard Vorhees, came three years after von NotHaus’ conviction in Asheville, N.C., and the filing of assorted post-trial motions, including an attempted legal intervention by Gold Anti-Trust Action Committee, Inc. The ruling on those motions, all rejected as baseless by the court, clears the way for von NotHaus’ sentencing next month. After his conviction, the man who described himself as the “architect of the free-money movement” argued that federal laws under which he was charged are unconstitutional and that federal prosecutors didn’t present sufficient evidence showing he intended to violate counterfeit laws. The 70-year-old founder of the so-called “Liberty Dollar Operation” minted his own silver coins that looked very much like U.S. silver dollars, intending them to be used as “private barter currency” for goods and services in direct competition with the Federal Reserve. He sold them to distributors in a Pyramid-style operation, accepting Federal Reserve greenbacks for the purchases, reportedly putting more than $20 million Liberty Dollars into circulation before being arrested by the FBI on federal counterfeiting and conspiracy charges. The post-conviction motions, the judge said, presented “a question as to the scope and extent” of Congress’ exclusive power to coin money. Von NotHaus argued his conviction “infringes on the public’s right to utilize private bartering systems” and that it is not illegal or counterfeiting for a private individual to compete with the Federal Reserve. The judge said he was not ruling that private barter systems are illegal. He also said that while the Constitution doesn’t give Congress the exclusive right to coin money, it does “expressly prohibit” states from doing that. “It is undisputed that Congress has the ability to enact comprehensive laws concerning the coinage of money, the value of money, and counterfeiting,” the judge’s ruling said. Further, the judge ruled that Congress does indeed possess the power to make it illegal for someone like von NotHaus to mint coins—whether they resemble U.S. coins or are of original design—if they are intended for use in monetary transactions. Vorhees order said the jury that heard the evidence against von NotHaus found that his Liberty Dollars were counterfeit and that he intended to break federal law by minting and selling them. The judge said the jury that heard the case “was in a position to evaluate the specific and fine points of the Liberty Dollars” before unanimously concluding they were counterfeit and that von NotHaus intended to break federal law. “There is a heavy burden to prove that a jury’s verdict and findings of facts are wrong,” the judge said, denying von NotHaus’ motions to set aside his convictions or grant a new trial. 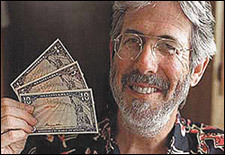 While operating the Royal Hawaiian Mint in the late 1990s, von NotHaus founded “The National Organization for the Repeal of the Federal Reserve Act and Internal Revenue Code” or NORFED. To circumvent laws, he also started the Free Marijuana Church of Honolulu, where he called himself the "high priest." But it was his Liberty Dollar operation that captured national headlines as von NotHaus claimed NORFED would compete with the Federal Reserve System just like FedEx does with the U.S. Postal Service. He later moved its headquarters to Evansville, Ind., Later, where he teamed with James W. Thomas, publisher of Media Bypass, a now-defunct magazine popular with antigovernment “Patriots,” sovereign citizens and extremists with anti-Semitic agendas. NORFED issued and circulated five coins in one, five, ten, twenty and fifty dollar denominations. The Liberty Dollars, marked as “America’s inflation-proof currency,” were minted at Sunshine Minting, Inc. in Coeur d’Alene, Idaho. While the coins actually contained silver, trial evidence showed von NotHaus and his operation would recall and re-mint the coins if the “average spot price” of that precious metal exceeded the face value of a particular coin.